Photographs are obvious catalysts for memory. They sometimes deliver more than one expects. Someone I follow on twitter posted some old pictures of the Kellogg’s 1988 Tour of Britain (which spookily include a blurred Jimmy Savile) today. I was there at the final criterium in Westminster, and my hazy memories are formative in my passion for cycling (this was the first international racing I saw in the flesh). This photo of Malcolm Eliott, who won that edition, is one I have seen before. However, I never noticed that I was in the crowd in the blurry background until today (unless I am seeing what I want to see)… and indeed Elliott was the first pro I had an on road encounter with (a few years later), in Sheffield, stopped at the lights. 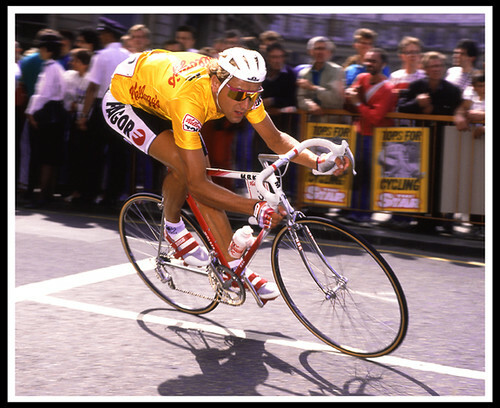 This entry was posted in absurd, cycling, memories, psychology, racing by spandelles. Bookmark the permalink. I like these sorts of photos, which evoke strong memories. As someone who only got into road cycling 5 years ago, aged 30, I am sort of longing to create these kind of memories for myself but as it is, they are 2007 TdF doping scandals, the 2008 Tour of Britain and things like that. What an incredibly aggressive position! Was this a time trial? It was a criterium round Westminster, amazing spectacle!